register on the Czech Tournament website too before 15th June. - Registration is opened for 60 foreign competitors and czech competitors. - Registration is closed for foreign cubers, we reached 60 competitors from abroad. 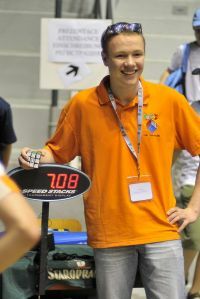 Czech and slovakian cubers can still register. - Pyraminx final will have 8 competitors instead of 4. - 2x2x2 final will have 8 competitors instead of 4. - Added Rubik's Magic and Rubik's Master Magic finals on friday. Both will have 6 competitors. Financial prizes: 1 000, 700 and 500 CZK for the 3x3x3 event and material prizes for most participants. Starting fee: 8,5 EUR regardless of the number of competitions which the participant takes part in. During the competition the official WCA regulations will be applied. Results of the competition will be added to the official WCA World Rankings. Before the competition starts all competitors can practice on the official timing equipment: the Stackmat timer. All puzzle brands may be used during the competition, as long as the puzzles comply to the WCA regulations. News on Czech Open 2010 will follow in separate e-mails to registered competitors. If you have any questions on accommodation and hotels, feel free to contact the czech organiser, Jaroslav Flejberk also contact for czech email, contact Olivér Perge for english speaking contact and for questions concerning the competition and WCA regulations. If you may have any questions, feel free to mail me at pergeoliver[at]gmail[dot]com!